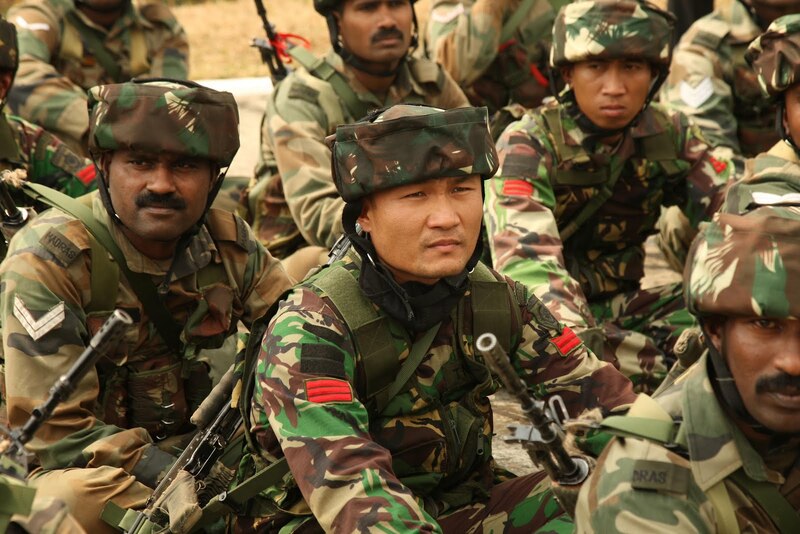 The Armies of India and Indonesia concluded a week-long joint military exercise today. 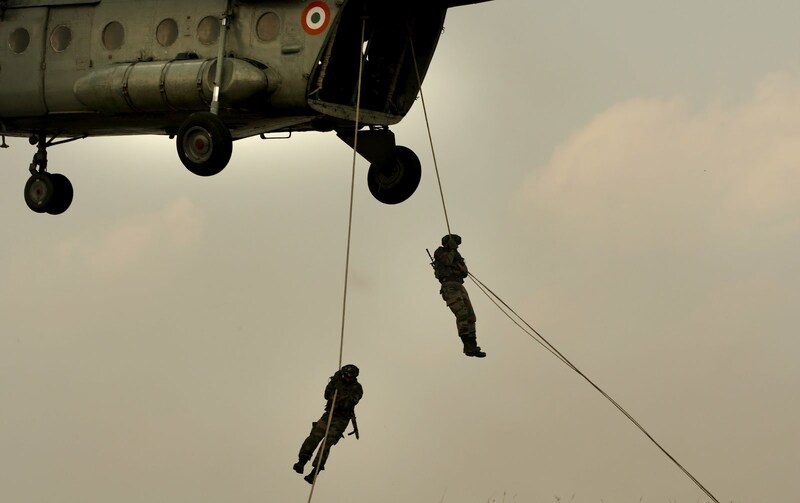 The operational part of the first-ever platoon-level joint training exercise, Exercise ‘Garuda Shakti’, was conducted at the Indian Army’s elite 'Counter Insurgency and Jungle Warfare School’ (CIJWS), Vairengte in Mizoram. 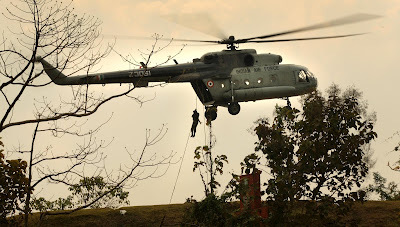 Training together to counter the scourge of insurgency in various contemporary scenarios including jungle warfare, Chakravyuh, the three-day outdoor validation exercise, tested the weeklong training, imparted at various Counter Insurgency (CI) modules and at the plethora of firing ranges in the guerrilla warfare school. Chakravyuh ended with the busting of a simulated insurgent hideout in Mizoram’s Lushai Hills, in the wee hours today, after a grueling nightlong march. The Indonesian National Army (Tentara Nasional Indonesia-Angkatan Darat, TNI-AD, in short) troops led by Lt Col Gatot Heru Puana of KOSTRAD (Indonesian Army’s Strategic Reserve Command) belonging to the 13th Infantry Brigade comprised of five officers, six Non-Commissioned Officers and 14 Privates. 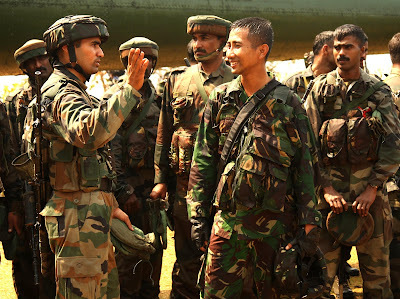 Troops from the 19th Madras Infantry Battalion, of 21 Mountain Division under Eastern Command, currently deployed in CI operations in the northeast sector, comprised the Indian side. 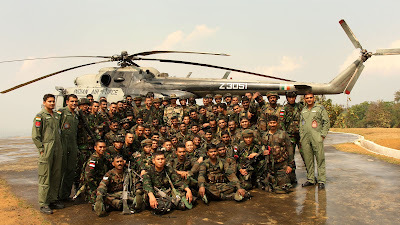 “They are very sincere, devoted, well-prepared and eager to learn,” said CIJWS Commandant, Maj Gen AK Sen, talking about the Indonesian troops while observing from close quarters the ‘slithering’ and ‘special heliborne operations’ from an IAF Mi-17 flown in from nearby Kumbhirgram airbase in Silchar, Assam. 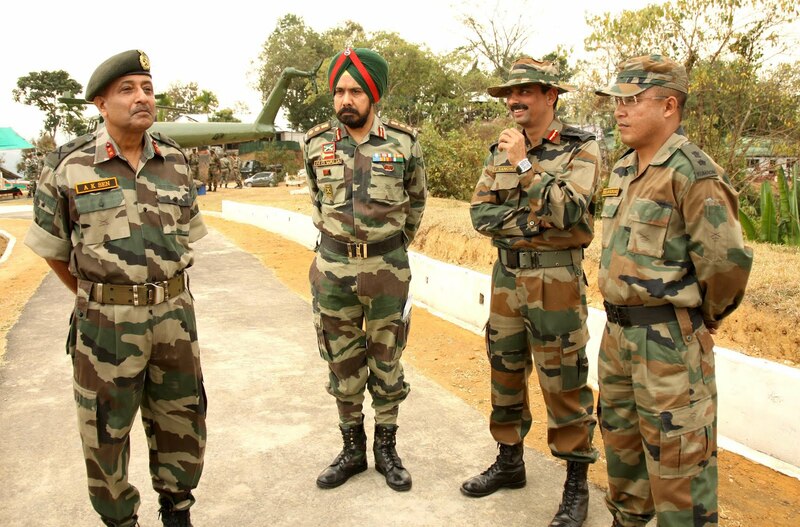 “The visiting troops were put through a rigorous initiation process, and they fared as good as their Indian counterparts,” he added. The exercise which began on February 20, is aimed at building closer military-to-military ties, among its many other objectives. 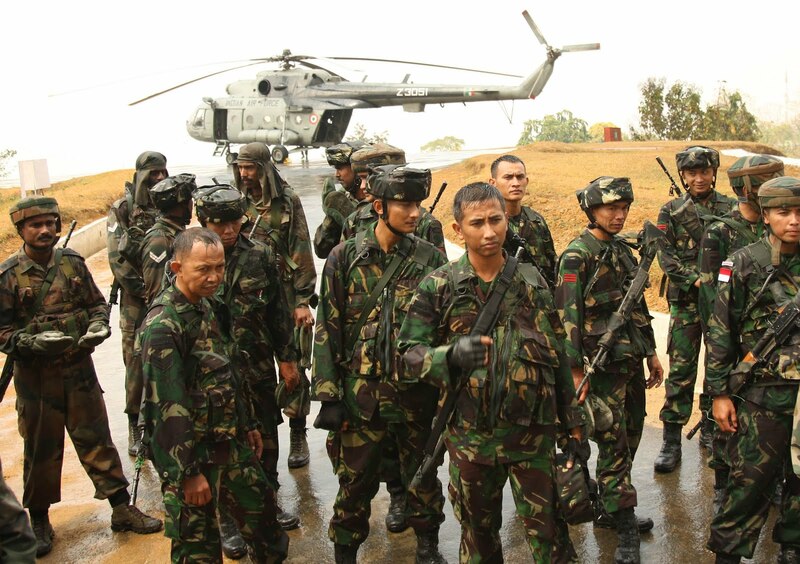 “This training has actually helped us to know each other’s procedure and drills including firing tactics,” said Gen Sen, adding that the firing ranges at CIJWS particularly interested the Indonesian troops, just as they did to the Bangladeshi, Polish and Israeli troops who trained here in the recent past. CIJWS Vairengte has over 13 different types of firing ranges catering to every conceivable indoor and outdoor scenario, ranging from urban, semi-urban to rural settings. Bringing in realism in training, Infantry Weapons Effect Simulation System (IWESS) and Small Arms Training Simulators (SATS) are also extensively used. The landscape and the inimitable replicated settings here in CIJW make it the most preferred destination to train for several armies of the world. 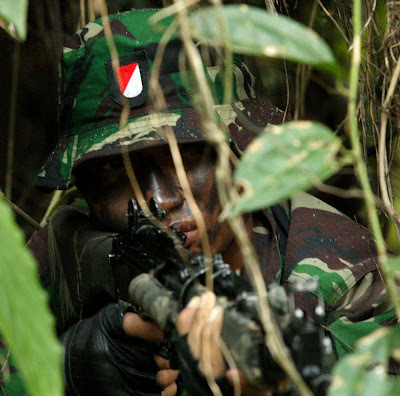 For proper assimilation of the nuances in CIJW operations for the Indonesian troops, all training and attack drills were coordinated by having two mixed platoons (comprising around 30 soldiers each) of KOSTRAD soldiers and the Indian Infantry troops, overseen by senior military observers. 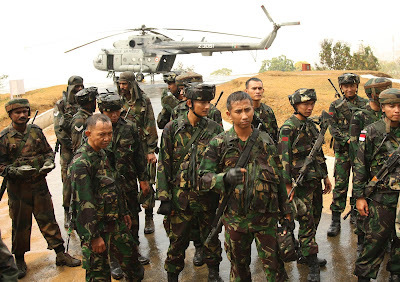 Praising the professionalism of the Indian Infantry soldiers, the leader of the Indonesian troops, Col Gatot observed that the Indian troops are very well equipped to fight the insurgents. While finding some of the training tactics very similar, he said that the concept of ‘Buddy’ system was something they would like to emulate. “Back home we operate in big groups,” he says. A conglomeration of more than 17,500 islands on either side of the equator, the Indonesian Republic whose national fabric represents ‘Unity in Diversity’ as much as it is avowed here in India, has also been besieged with terror-related attacks in recent times. “Our counter-insurgency related operations are mostly in the border areas,” the Colonel apprised, adding that the training would come in good stead upon their return. The formal closing of ‘Ex-Garuda Shakti’ will take place tomorrow, with both sides exchanging feedback and mementoes, and rounding off with a military-style campfire with gourmet meals, comprising both Indian and Indonesian delicacies, including cultural exchanges.